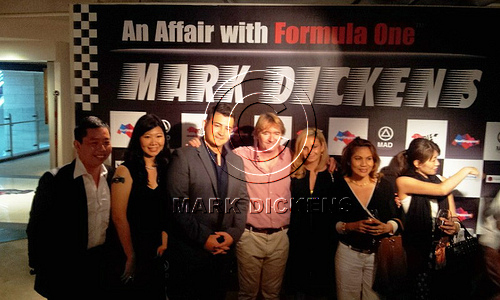 The official launch of, “An Affair with Formula One” was on Wednesday 19th Sept 2012 at the Museum of Art & Design (MAD). 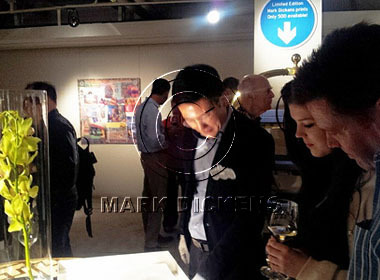 Mark Dickens graced the opening ceremony together with invited guests, celebrity VIPs, patron of the arts and motor sport. Mark Dickens was invited to give his first solo exhibition in Singapore, by the MAD Museum of Art & Design and Talent Street, in conjunction with the 2012 Grand Prix Season Singapore. In 2011, Mark Dickens was commissioned by the CEO of Formula One™ Management (“FOM”), Mr. Bernie Ecclestone to create 19 paintings, one for each Grand Prix. The commission showcased the prolific and vibrant world of Formula One™ with the architectural and cultural dynamism of each host city during its 2011 season. His showcase, “An Affair with Formula One” will unveil 10 new paintings evoking the spirit, adrenaline and glamour of Formula One™ races in the year 2011. In order to absorb first-hand all the culture, atmosphere and excitement of vary cities that are part of the world’s leading motor racing championship. Mark spent time to attend all of the 2011 races, in order to represent the spirit of the races in this series of commissioned work. In this collection, four paintings will focus on the world’s premier night race – the Formula One™ Singtel Singapore Grand Prix while the rest give an artistic perspective based on all the high octane races held in the other circuits and cities. His images give a glimpse into the alluring world of technology, racing pedigree set against the cosmopolitan skyline of every host city. Limited Prints on Sales as well, during the exhibition. Mr Dickens’ work can be found in the Royal collections of H.H Sheikh Hamdan Bin Zayed Al Nahyan and also private-public collections around the world. Artitute is delighted that MAD Museum hosts such one-of-a-kind exhibition as part of the 2012 Grand Prix Season Singapore, which is a diverse calendar of activities happening outside of the circuit during the race period. Having Artists and their works featured along major events that happen in the City, helps the local art scene to grow more vibrant & make it make lively.